Jocelyn Frost, Therapist to demigoddesses, is about to lose her job. 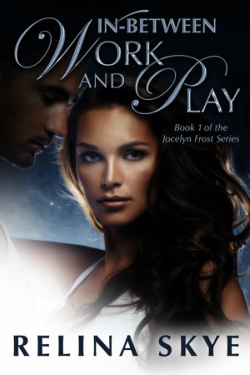 In an effort to keep her job Jocelyn takes on the task of trying to find the one thing all of the highly fertile demigoddess want most, a contraceptive method that actually works. But that is only one of her troubles. The people in her life are getting hurt and for no reason that Jocelyn can discern, she is at the center of it all. With only a couple of days to find a solution, she will need to battle more than just the dark forces that are trying to sabotage her efforts. Jocelyn will have to come to terms with her own self-doubt and rely on new friends to help keep her safe. Warning: Due to language and sexual content this novel is not suitable for readers under the age of 18. Held accountable for the true deaths of four vampires, Jocelyn Frost needs to save herself from their clan. As an employee of the Bureau of Converging Worlds, they offer to give her some new forms of protection while she serves the terms of her punishment. If she doesn’t mind wearing vampire repellent perfume. If she doesn’t mind having her home warded against unwanted guests. If she doesn’t mind wearing a bracelet that may or may not be cursed. But as any demigoddess from Earth comes to learn after being drafted by the BCW, that’s all part of working between dimensions with every type of mythos and fae imaginable as co-workers. All Jocelyn has to do is survive the terms of her ten-year contract with her employer, learn how to gain control of her light magic and avoid the vampires that want to use her as a weapon.